SLC Designs; Handmade silver and gold beaded watches. On Sale! Venetian Rose Twist Earrings; 1920's antique Venetian glass 'barber pole type' beads which are a lovely soft pink with a twist of gold aventurine with rose gold vermeil (vermeil is high carat gold over sterling silver) and Swarovski crystal. Drop is approx. 1½ inches / 4 cm. Was £22.50 Now £15.00 rose gold vermeil hook style pierced fittings. On Sale! Summer Rose Earrings; Swarovski crystal discs with more Swarovski and sterling silver. Was £21.50 Now £15.05 sterling silver pierced leverback fittings. On Sale! Ametrine Facet Earrings - AA quality micro-faceted Ametrine rondelles showing nice colour changes within the stone; Vermeil throughout; drop is approx. just under 1½ inches / 4cm. Was £28.50 Now £21.50 Vermeil pierced (hook-type) fittings. On Sale! 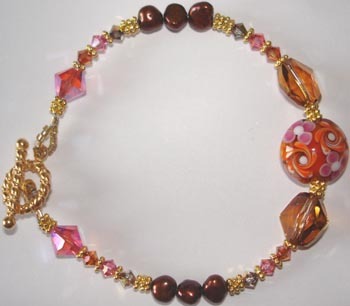 Spice Island Bracelet; American artist-made lampwork glass bead, Japanese Delica seed beads, Vermeil with chocolate freshwater pearls and some rare speciality colour Swarovski crystal finished with a Vermeil toggle clasp; strung on Beadalon Pro. On Sale! Bohemia Necklace; reminiscent of 1920's 'flapper' jewellery this necklace can be worn long, tied, and will also make a multi- strand necklace. Swarovski crystal, freshwater pearls, Swarovski crystal pearls, Goldstone semi-precious stone, Japanese Miyuki beads, handmade antique (approx. 1920's) and contemporary Venetian glass, Czech firepolished glass, clay tubes, a ceramic star, 1920's Bohemian flapper beads, and antique glass beads (approx. 1920s-1930's Bohemian origin), all wired with copper with sections of copper chain. On Sale! Lime Soda Heart Earrings; handmade silver lined Murano glass beads with lime-soda stripes, Swarovski crystal, Vermeil spacers and headpin, goldfilled heart charm and earring fittings (hook style) - these have a drop of approx. 1 inches / 2.5 cm. WAS £28.00 NOW £18.50 gold-filled pierced (hook-style) earring fittings. On Sale! Verde Bracelet; Venetian and lampwork glass, Swarovski crystal, Czech glass, gold-filled wire and Vermeil clasp and beads. On Sale! Caribbean Earrings; Prasiolite (Green Amethyst), Aquamarine, lots of Swarovski crystal and sterling silver. Drop is approx. just under 1½ inches/ 4cm. With sterling silver leverback (pierced) earring fittings. On Sale! Venetian Flower Lime Blue Earrings; handmade Murano glass flowers with Swarovski crystal, sterling silver throughout. Drop is approx. 1¼ inches / 3 cm. Was £22.50 Now £15.75 sterling silver hook style fittings.